England - Visit 2011 - tipplerzuechters Jimdo-Page! On the 06.05.2011 my son (Oliver Petrinovic), Aleksandar Tanevski and I (Antun Petrinovic) made our annual visit in England. At first we met our good friend Paul Green (picture1), who also invited us to stay the night at his place. We were very thankful and agreed to stay overnight. Afterwards Paul Green went with us to see Tom Dilks, who very friendly welcomed us and took some of his time to talk with us about Hughes-pigeons (picture2). On the way to Paul Bowden we picked up our good friend Jim Johnson, who also accompanied us (picture 3). After our visit at Paul Bowden’s place, we got Jim Johnson back home and here we were able to have another look at his loft (picture4). At the end of the day Paul’s wife made a tasty dinner and the supplies for our way back home for us. Here we want to hearty thank everybody and especially Paul Green for his hospitality. With us we brought some pigeons back, among two pairs of Tom Dilks (picture 5), who is the only tippler breader left who got his birds directly from G. Hughes. 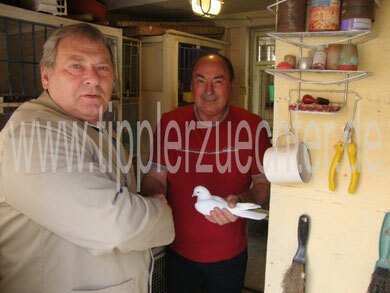 The named pigeons are in the photo gallery.